His hard work paid off. 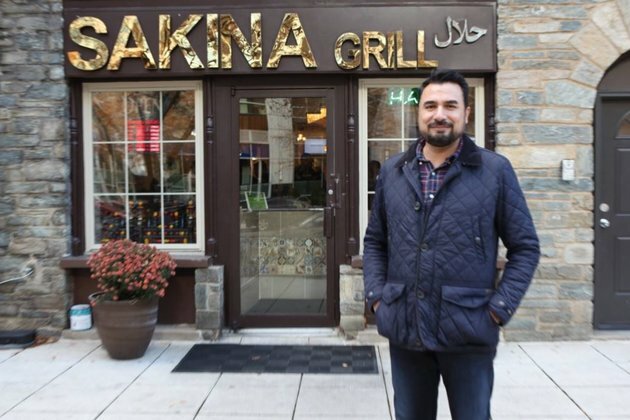 After more than 20 years, hes now a successful entrepreneur and owner of a popular Pakistani-Indian restaurant just a few blocks from the White House. But whats most remarkable about his story is what hes doing in his restaurant every day. He says its his way of heeding the principles of his Muslim faith. I know God is happy with me, what I do, because I do it with my pure heart, with my pure intention, to uplift others without seeking any reward, any recognition, he says. I dont need any awards, I don't need any money. I just want to please Him. Mannan helps the needy he says, because growing up poor in Pakistan, he knows what its like to be hungry. I have nine siblings and [we didnt have] much to eat when you are poor and you [dont] have things that other people have, when you get it, you want to appreciate, you want to share with others, he said. His desire to share deepened as he worked as a limousine driver in the nations capital. He saw homeless people on the street, day and night, in all kinds of weather looking for food in trash cans. I don't want to see another human being going through the poverty that I went through. I don't want to see another human being going through the hunger that I went through. I want them to have that feeling that they were being accepted, so they can come and sit here and eat with respect, he says. We will love you and respect you the same way we respect a paying guest. We will treat you like family, he said. I think that he's a saint. Hes a beautiful man, he says about Mannan. My stomach was growling, I was looking for a blessing, then he popped up, gave me a card and invited me to a restaurant for lunch. And I was so overwhelmed and happy I couldnt wait to get here, and ever since then I've been coming. This is more than lunch,' he said. 'They give you enough to feed you for the rest of the day I think. The food is great, the people are nice. I wouldnt mind working here! Griakley says he once asked Mannan what he could give him in return for the free food. Because most people expect you to give back. But he said 'no, no, no, no, no!' He just wanted me to have a good meal, he recalls. I couldnt believe that. It was so nice. I loved it. Mannan estimates that hes provided more than 80,000 free meals since the restaurant opened in 2013. And when hes not feeding the needy in his restaurant, Mannan delivers meals to local shelters and churches, and organizes food and clothing drives at nearby parks. Some people tell me homeless people are using drugs and youre feeding them; that's bad.' To which he responds, For you, its bad, for me, it's joy. I see a person whos fallen to the ground. Whatever problem they went through to become homeless, its not my job to judge my job is to give them respect and love. First time customer Geralyn Nathe-Evans was visiting from Minnesota when she read about Mannans mission in an article. I have a deep interest in social justice, Catholic social teaching and so to be part of something bigger than myself, my son and I chose to come to lunch here today to support and be a small part of a great thing, she said. If youre a medical doctor, can you love him through your practice? If you are a lawyer, can you love him through your practice? Be kind and be compassionate to your client? he asks. In doing so, he believes we will all prosper and flourish as a society. Just uplifting others is a joy for me. It doesnt matter [what] color, religion you belong to. We are all human. I am focusing on humanity. I'm bringing humanity together and this is my mission.